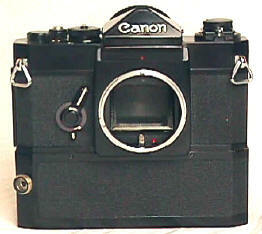 Canon's 1972 High Speed F-1 for the 1972 Olympics was available only by special order to credentialed press photographers. It was the fastest SLR motor drive made to that time. Its fixed pellicle mirror allowed continuous viewing (without the typical SLR blackout when the mirror goes up), and higher motor speeds up to 9 frames per second. The 20/1000mm thick pellicle mirror directed part of the light to the finder and the rest to the film. The High Speed F1 was Canon's answer to the Nikon F High Speed cameras. This was the first time Canon clearly beat Nikon for bragging rights. 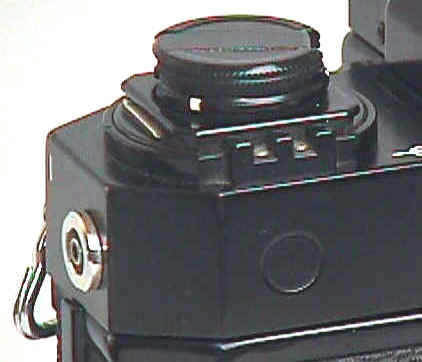 Nikon's F High Speed, also introduced for the 1972 Olympics, was slower at 7 fps but had to have the mirror locked up for top speed -- not the best situation for a SLR. Nikon remedied the situation with its 9 fps F High Speed for the Montreal Olympics, with pellicle mirror. The 1972 9 fps F-1 High Speed is based on the mechanical shuttered F1. Production of the 9 fps was probably less than 100. 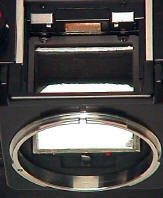 In 1984 Canon introduced an even faster 14 fps F-1 High Speed with pellicle mirror, built on the electronic F-1 body. Note the very deep permanently attached motordrive. Strangely, the motor settings of 9, 7, and 4 were not labeled. 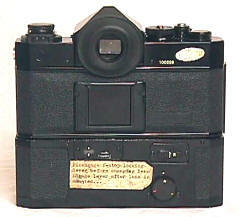 The High Speed's fast operation requires stop down mode lens operation, i.e. at the lens' shooting aperture. 9 fps was beyond the limits of the FD lens mount's automatic diaphragm operation. 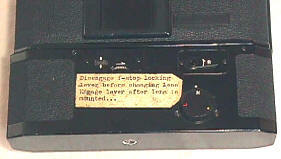 The High Speed would not operate unless the lens was stopped down using the front mounted stop down lever. 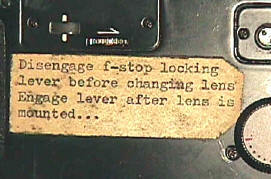 That same lever had to be disengaged before you could change the lens! The High Speed's reason for being is its fixed pellicle mirror. The see-through mirror did NOT go up and down, allowing for continuous viewing without the traditional SLR blackout and for very high motor speeds. Pellicle disadvantages are slightly degraded image quality since the pellicle is always in the optical path, loss of about 1/2 f/stop of light to the film since light is directed to the finder, a slightly dimmer finder since all the light is not directed to the finder for focusing, and difficulty keeping the pellicle clean since it attracts dust like a magnet. 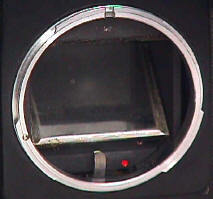 Older pellicles, such as those in the Canon Pellix, have shown a tendency to yellow and separate. No shutter speeds below 1/60th, with a shutter speed range of 1/60th to 1/1000th. No full aperture operation, all shooting was at stopped down aperture. 10 AA's? No, that's 10 each side for a total of 20 for its separate shoulder batter pack. Canon's High Speed affirmed Canon's commitment to the Professional market, proving Nikon was no longer alone. While the F1 was competitive with Nikon's F2, the 9 fps High Speed F1 was clearly superior to the Nikon F's slower 7 fps F High Speed that required mirror lock up. It was the first time Canon clearly beat Nikon for bragging rights in the great SLR race which continues to this day. Canon has more experience with pellicle mirror cameras than any other camera manufacturer. Canon made two standard production pellicle SLRs, the Pellix and the recent EOS RT, besides their special High Speed F1's and EOS 1. Other than a Canon Hansa, it's very difficult to find a rarer Canon. Revised: November 25, 2003 . Copyright � 1998-2002 Stephen Gandy. All rights reserved. This means you may NOT copy and re-use the text or the pictures in ANY other internet or printed publication of ANY kind. Information in this document is subject to change without notice. Other products and companies referred to herein are trademarks or registered trademarks of their respective companies or mark holders.